Tribute to Phil Newcombe	Rest Peacefully, your legacy lives on. He will always be remembered as the person who represented Shodokan Aikido in the UK and Spain. A man whose devotion to Shodokan was famed and still inspires Aikidoka around the world today. He is a true friend. He is a legend. He is Phil Newcombe. Phil’s decades-long relationship with Aikido began when he joined an association called, “The Aikido Development Society” For several years he trained until he graded to 2nd dan. Then in 1980 or 1981, Phil was left with his jaw dropped in awe after watching a demonstration by Tomiki Shihan student and protege, Nariyama Shihan. Indeed, Phil Newcombe had found his “Holy Grail.” Nariyama Shihan’s skills were the paradigm of what, Phil believed, was Aikido. There was no question in his mind, Shodokan was the Aikido he wanted to learn. Over the next year or so, Phil saved his hard earned wage and prepared for a trip to Japan. 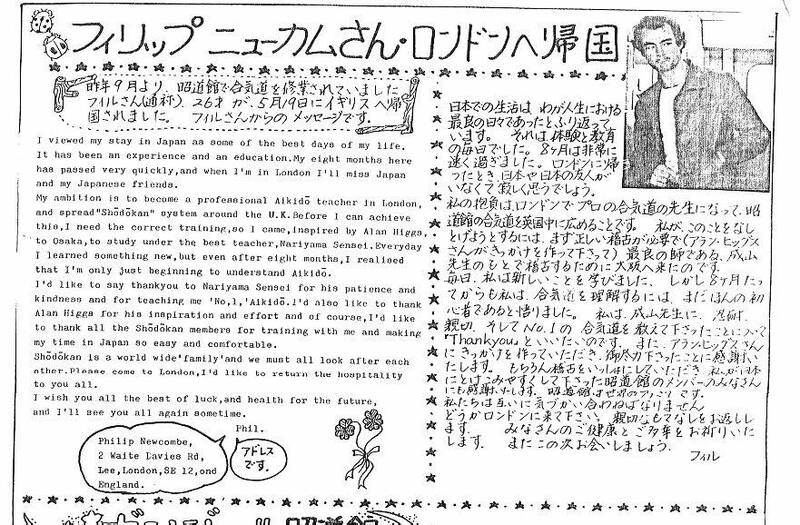 It was early spring in 1983 when Phil arrived in Osaka. He was met at Shin-Osaka station and brought to Honbu by Nariyama Shihan. Phil’s first week of training was difficult; as he said at the time, “I feel like I’m on a different planet.” Indeed the language and customs of Japan were completely alien to him. However, as the weeks passed, Phil adjusted to his new environment without too much trouble and was soon navigating his way to different dojos around the metropolis of Osaka. Every day Phil would be with Nariyama Shihan either practicing in Honbu or traveling by train or car to a different training location. He was, for all intents and purposes, Nariyama Shihan’s assistant and uke. As the weeks gave way to months, Phil’s Aikido skills greatly improved. He would, after every practice, do one hundred atemi waza uchikomi ( repetition training) left and right in front of one of Honbu’s two full-length mirrors. His understanding of basic practices also developed as the questions that had plagued him for years were answered through ki-hon. As Nariyama Shihan said to him once, “Don’t question everything. Do it, and you’ll understand.” These words, Phil always remembered. By the end of his stay, he had a road to follow, a long and sometimes arduous path but one he hoped many others around the world would follow. During his final week in Osaka, Phil wrote a message for all Shodokan members. In it, he thanked all who had helped him. Upon his return to the UK, Phil began teaching the skills he had learned in Japan and, after reconnecting with members of the ADS (Aikido Development Society), he became, for a short while, their Honorary Technical Director. Phil also, along with brother Jim, established his dojo, and although it took time to build, Phil’s dedication to Shodokan never wavered; his commitment saw dojo membership slowly increase until there was a strong core of regular Aikido practitioners. Phil was never stubborn in his belief in Shodokan. He welcomed everyone to his club and seminars and was always open to interpretation. It was as though he was saying, “The proof of the pudding is in the eating” an old but somewhat apt adage which, as it turned out, helped membership grow. In the early part of the new century, Phil together with his family, and seeking sunshine and beaches, moved to Malaga, Spain. Once settled, Phil enjoyed practicing with Spanish Aikidoka. The men and women he exercised with were welcoming and interested in experiencing what Phil had studied in Japan. It wasn’t long until Phil became a respected member of Spanish Aikido. Phil Newcombe is, in many ways, responsible for a new generation of Aikidoka. The students he taught after leaving Japan are now themselves instructors with growing clubs. 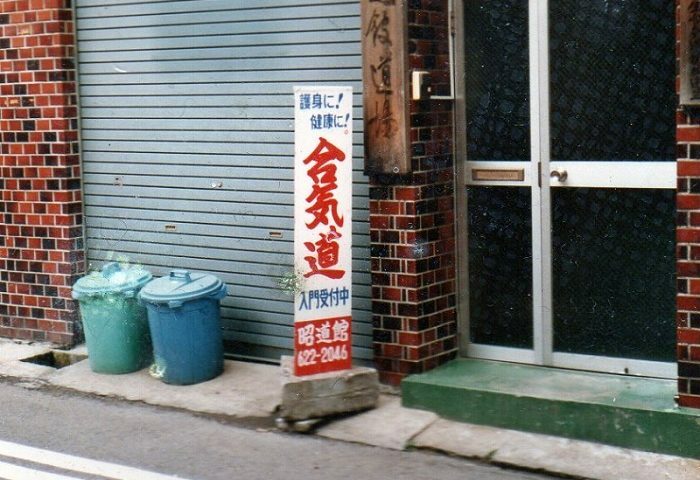 He kept the Aikido flame burning in the hearts of all Aikidoka by holding seminars or arranging for Nariyama Shihan and other Honbu brethren to visit. Throughout his years of Aikido instruction, Phil continually inspired students and teachers alike with his skills and knowledge. He was open-minded and treated everyone as an equal. He was an instructor and a guide for students in their quest to conquer Aikido. Rest in Peace, Phil Newcombe your legacy is safe and will never fade. Although you are no longer physically with us, your spirit, your determination, your kindness and your skills are ingrained into the fabric of every Shodokan Aikido dojo around the world.